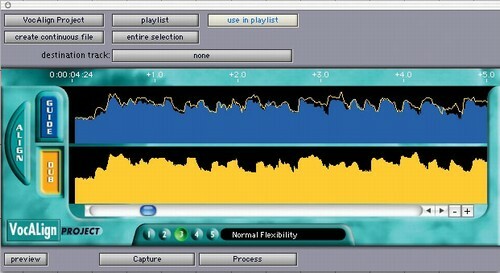 VocALign's unique ability to align two signals allows it be used creatively to take guide tracks or even live tracks and create performances with perfectly aligned overdubs. This AudioSuite plug-in gives the producer the ability to choose the rhythm and pace for a specific vocal or even lay down the required tempo pattern for the artist. VocALign gives you perfectly aligned double-tracked vocals, tight backing vocals, and easy re-grooving of recorded vocals for remixing. Artists can now concentrate on performance rather than sync during overdubbing sessions.